First of all, thanks to Steve for including me in this remarkable forum, and thanks to all the other participants for their insightful comments about the book. Clearly the blog provides an opportunity for a different kind of scholarly interchange than the usual book publication and book review cycle. Gulag Boss is a fascinating memoir that I read with great interest, both as a scholar and as a teacher. It raises a number of fascinating issues and questions, many of which I will address in my forthcoming book review in the journal Gulag Studies. But in the interest of not duplicating that review or my colleagues’ posts, I will focus here on the book’s relevance to the study of one region of the Soviet Union, the Soviet Far North, in particular the territory of the Komi Republic. I have more than an abiding interest in this region, as I am currently finishing a book on the history of Vorkuta, the camp complex turned company town located on the site of the largest coal basin in European Russia. Mochulsky’s camp, Sevpechlag, was created to build a railroad to connect the coal coming from Vorkuta’s mines to the transportation network of Northwestern Russia. One of the first trains bound from Vorkuta to Leningrad with coal during World War II. 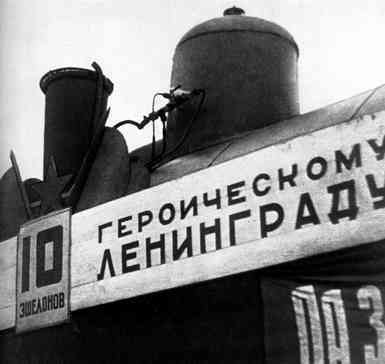 The banner reads, "10 Eshelons to Heroic Leningrad!" In writing the history of Vorkuta, I have grappled with the question of why the railroad that connected it to the Soviet “mainland” was built in the early 1940s, and in fact, why it was ever built at all. By the time railroad construction was deemed a high priority by Lavrentii Beria in 1940, only a few months before Mochulsky’s arrival in Sevpechlag, prisoners had been already been mining coal in Vorkuta for nearly a decade. Yet the expansion of Vorkutlag, as well as its economic relevance, had been strictly limited by its remoteness and inaccessibility. The story that Mochulsky tells about his journey from Moscow to Abez, the administrative center of Sevpechlag (which was not far from Vorkuta) gives a good indication of just how inaccessible the whole region was prior to the construction of the new rail link. During the winter of 1940-41, the Usa River froze earlier than usual, leaving barges full of prisoners, camp employees, and supplies stuck in the ice. As Mochulsky recalls, the result was that it took him 45 days to reach Abez.1 This episode clearly indicates the degree to which a direct rail line was needed if Vorkuta was to become a major coal mining center. But lack of accessibility only tells part of the story of why such a railroad was built. The broader question is why Vorkuta’s coal, which was so difficult to extract and transport, was considered to be so essential that the Soviet state expended massive resources building a railroad across the open tundra to reach it. One reason, which I learned early in my research, was that coal for Vorkuta was essential to the Soviet war effort, especially once the Donbas and the Mosbas were lost. Coal from Vorkuta would be some of the only fuel that was able to reach Leningrad during its 900-day blockade. Mochulsky’s memoir reveals another reason why Vorkuta’s coal was of strategic importance during World War II, which I had been unaware of: coal from Vorkuta was sent to Murmansk to fuel US and British ships that were delivering supplies under Lend-Lease. Using coal from Vorkuta for their return trip meant that the ships could carry less fuel on their journey to the USSR, making it possible for them to carry more supplies.2 This valuable insight goes a long way towards explaining why the railroad was treated with such strategic importance, and why it was completed rather than being abandoned like so many other grand railroad construction projects of the Gulag. Once it was built, this railroad, known as the Northern Pechora Mainline, would play a pivotal role in the history of the region. In the 1940s and 1950s it proved to be the lifeblood of a number of camp complexes in eastern Komi ASSR, including Vorkutlag, Intlag (a coal mining camp in Inta), and Ukhtizhemlag (a massive complex near the city of Ukhta that was dedicated to the extraction of gas, oil, and other resources such as radium). This adds yet another dimension to the question that Deborah Kaple raises in the introduction and afterword of Gulag Boss: to what degree were “perpetrators” like Mochulsky responsible for facilitating the death and suffering of thousands of unfortunate prisoners?3 While the author celebrates his contributions to the war effort, particularly in building a major railroad bridge near the town of Pechora, one must remember that it facilitated more than just the shipping of coal to the “mainland” to aid the war effort. The trains also carried tens of thousands of prisoners to the camps of Komi ASSR, and many of these prisoners would never return. Seen in this light, Gulag Boss also highlights one of the thorniest issues regarding the history and memory of the Gulag in Komi ASSR and other regions whose histories are closely tied to forced labor. It demonstrates the degree to which the region’s contributions to the Soviet war effort were intimately connected to the expansion of the Gulag system. Former Gulag communities such as Vorkuta, Inta, and Pechora commemorate their role in the Soviet war effort just as other cities do across the former Soviet Union. But how can they do so without glorifying the use of forced labor, the wrongful imprisonment and suffering of tens of thousands of innocent victims? Just as Mochulsky has done in this memoir, local leaders often promote the accomplishments of a “good man in a bad place.”4 Particular local contributions to the war effort are highlighted, while the uncomfortable details about whose labor was used, and under what conditions they worked, is skipped. To bring in the example of Vorkuta once again, city authorities there have glorified the wartime accomplishments of Mikhail Mal’tsev, the director of Vorkutlag from 1942-46, a man who even Solzhenitsyn acknowledged might have been the closest thing to a decent camp director.5 Mochulsky’s memoirs, as Kaple rightly points out, only further expose the difficulties that Russians face in coming to terms with their Soviet past. Alan Barenberg is Assistant Professor of History at Texas Tech University. I am so looking forward to reading your book. And I agree with you, we have to remember that the tracks and bridges that Mochulsky helped to build not only took coal away from Vorkuta, but made it possible to bring in so many prisoners to some of the most horrendous camps in the system. I also can’t wait to read your book, Alan! What you say about gulag memory is fascinating, and so true. The memoir made me think a lot about the perceived heroism surrounding the mission to build the railroad. There wasn’t even a war going on at the time Mochulsky was dispatched, and yet his sense of purpose was entirely wrapped up in the future/possible/likely war effort. This same issue relates to Steve’s book too and the ideology of labor/redemption, but writ large. For people like Mochulsky, the gulag itself was apparently redeemed by its economic achievements, at least while he was a part of the enterprise. Yet it does appear that he wasn’t entirely convinced, at least this problem of cost v. benefit seems to be something he’s working through in the memoir. I enjoyed your comments, Alan, on the importance of the Vorkuta railway to the Gulag’s contribution in the war, and your thoughts on how this is commemorated in Vorkuta today. I have to mention that I had a somewhat different perception of commemorative practices when I visited Ukhta and Pechora last summer. There the local historical museums in both towns make explicit mention of the suffering of prisoner-labourers who helped to build these towns and the railway linking them to Vorkuta. Some Ukhta and Pechora curators and museum directors are members of the Memorial Society. As well, the Ukhta State Technical University’s own historical museum – seen by a large number of university students every year – contains a major exhibit on the Gulag prisoners who contributed to the construction of the industries that graduates of this university will go on to work for. The director of that museum is Evgeniia Zelenskaia, a contributor to the Komi Republic’s martyrology series (Pokaianie: martirolog, now up to vol. 9 I believe) and a serious archival scholar. It may well be the case that local political leaders downplay the role of prisoner suffering, and celebrate the early Gulag management as pioneers, but I think in these museums one sees as commitment to a wider perspective. It’s also interesting to note that these museum-based historians had not yet heard of the Mochulsky memoirs – which of course have only been published in English – and were keen to read them. Thanks for your posting, the information about Ukhta and Pechora, and the general corrective to my rather one-sided assessment of commemoration in Komi. I’ve met a number of historians in Ukhta and Syktyvkar who are doing important work on the Gulag and keeping it in the public eye. The local museums that I’ve visited all make an effort to include exhibits on the Gulag and acknowledge the importance of forced labor. The Pokaianie series, which publishes archival documents, memoirs, historical essays, and lists of Gulag victims is a remarkable and very valuable project. As far as I am aware, the series receives a significant amount of state funding, which suggests that there is at least some commitment by the regional authorities to take the role of forced labor in the region’s history into serious account. On the other hand, I have often noted attempts to separate commemoration of the Gulag and the celebration of the great industrial achievements of the region. I think it is particularly pronounced in Vorkuta, which makes a certain amount of sense given the fact that over the past 20 years much of its industry has shut down and its population has been nearly halved. Unlike Ukhta or Syktyvkar, Vorkuta is a city fighting for its existence, and I think this makes it difficult to take a broader view of its past. It also doesn’t help that there are no formally-trained local historians working on the Gulag (at least that I am aware of), largely because there is no university there.